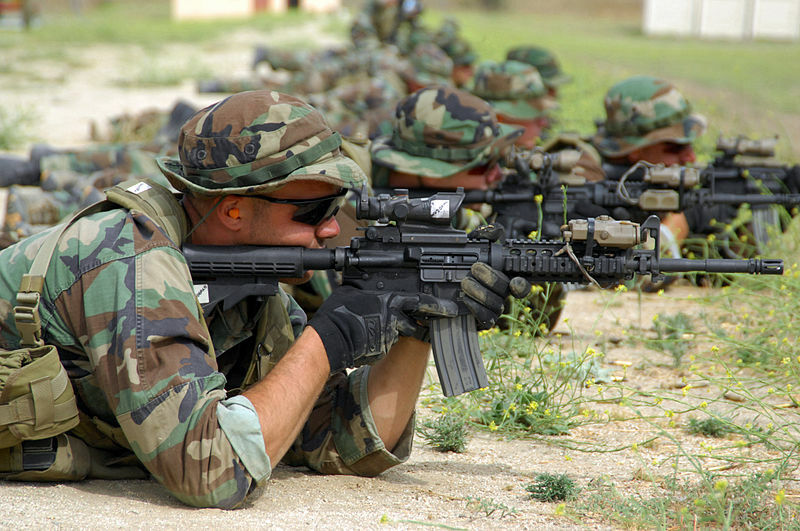 For more than 50 years one iconic rifle embodied the exceptional role the US military upholds over the world. Since its debut in the 1960s as a radical new small arm made from innovative materials, the weapon that became the M16 and its many descendants has proven itself against the odds. From steaming jungles to blistering deserts, the M16 was always adapted to never let down the GI’s and marines for whom it served as a primary armament. Although some may argue European battle rifles and even rival weapons from the Eastern Bloc were superior to it, the M16–for all its problems–has outlasted the competition. And it will keep doing so as US allies in every continent have benefited from using the M16 and the M4. But so have US enemies. The shocking absence of export controls, patent restrictions, and the furious demand by North American gun owners for AR-pattern sporting rifles have caused the M16’s derivatives and parts to spread everywhere. The extent of this trend has yet to peak. In the meantime, a variety of M16 and M4 clones with interesting modifications are now for sale to whomever can pay. Is this a silver lining or a persistent threat? The Caracal CAR 816 is an AR-pattern carbine resembling the Sig Sauer SIG516 and is tailored for special operations forces. Caracal LLC is a gun maker from the UAE responsible for equipping the country’s armed forces. 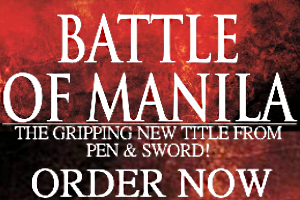 They also have a 7.62mm battle rifle and a DMR in their catalog. The Latin American colossus always had a thriving military industrial sector that carved its own niche in the global arms trade. But state-owned gun maker IMBEL never embraced the AR platform, preferring to build its own catalog out of the FN FAL and then choosing a clean sheet design for a modular 5.56x45mm carbine. The privately owned Taurus, whose pistols and shotguns are staples in many police departments, followed the same path with its ergonomic T556 but the model proved a commercial flop. So in 2017 the company unveiled its T4 or Te-Quatro for export to militaries abroad. The product offered few discernible improvements over the M4 but managed to attract large orders before the year was out. A civilian sporting arm was brought to North America at the same time called the T4SA. The T4’s only concession to modular aesthetics is a quad rail handguard for optics and accessories that aren’t in Taurus’ catalog–at least the end user can rebuild it to their heart’s desire. How the M16 ended up in Communist China remains a baffling mystery. It’s possible M16A1’s and CAR-15’s lost in the Vietnam War (1965-1973) were transferred by the North Vietnamese to their patrons out of strategic kindness. But during the 1980s there was a short-lived alliance between Beijing and Washington, DC that involved sharing some military production with state-owned factories in China. The military industrial conglomerate Norinco began mass-producing the CQ at the time for export. The PLA didn’t need it since its millions of soldiers had Type 81 assault rifles and R&D was ongoing for a new rifle with an intermediate cartridge. The original CQ looked cheap and weird. The lower half of the stock had a pointed bump with no discernible use. The curved pistol grip looked aesthetic rather than ergonomic and the CQ was fed by the same 20-round box magazine as the original M16. The ribbed cylindrical handguard even had deep contours that defied explanation. In what could be the ultimate coincidence, the CQ had a regional competitor with Taiwan’s T65K2 that had so many improvements its imitator from the mainland didn’t. Remarkably, the CQ enjoyed strong demand and was even licensed to government factories in Iran and Sudan. In 2006 Norinco began exporting a copy of the M4 carbine it called the CQ-A or “CQA.” It was an export success too and in 2017 Beijing used it as a diplomatic tool for improving relations with the Philippines. The oddest AR-pattern rifle ever made comes from Central Europe…and it isn’t any of Sig Sauer’s bestsellers. The little known gun maker Czech Weapons owns a unique “locking mechanism” it uses on its vast array of small arms. A true novelty is the NMD 16 that was made to resemble an M16 with its distinctive front and back sights and removable carrying handle. The NMD 16 is chambered for 5.56x45mm rounds and it accepts Magpul magazines–that’s it. To maintain its attractiveness the NMD 16 uses a milled handguard with quad rails for attaching optics and grips. It’s unclear if Czech Weapons offer barrel assemblies measuring less than 20 inches. Of course, there’s a six position collapsible stock added rather than keeping a fixed stock. The combination of lower and upper receivers is interesting for its formlessness with just the fire selector resting above the trigger. Czech Weapons sells grenade launchers, sniper rifles, and submachineguns based on its own designs. They’re a curious selection the rest of NATO haven’t caught up with yet. The Islamic Republic’s latest attempt to produce a tacticool infantry small arm was an HK416 clone touted as homegrown innovation. Via Mehr News. For a brief period between the 1960s and 1970s the Shah of Iran was the most enthusiastic customer for US-made weapons and squandered billions on fighter jets, missiles, and warships. But the Iranian Artesh never adopted the M16 because the West German G3 was its standard issue battle rifle. At some point during the 1990s and early 2000s, however, the Islamic Republic’s state-owned gun maker began making copies of the Norinco CQ. So here’s an instance when a short-lived US ally–that’s China–shared lethal technology with an anti-American rogue state and suffered no repercussions. Let that sink in. Iran’s Armament Industries Group (AIG) is responsible for the production of the Sayyed S-5.56 together with several infantry rifles. It was a faithful copy of the Norinco CQ until recently, when modded variants began appearing in Northern Iraq and Syria. In 2016 the Iranian press hailed the debut of a gas piston AR-pattern 5.56x45mm carbine with a retractable stock and quad rails. Yes, the Iranian Sayyeds are available for export too. While the Jewish state’s modern small arms production predates its independence, AR-pattern rifles in the holy land were a result of a special relationship between Tel Aviv and Washington, DC. The IDF began receiving M16A1’s and CAR-15’s after the Yom Kippur War in 1973 as part of the US’ commitment to a regional ally. Although the Galil remained with some army units, it wasn’t until the adoption of the Tavor bullpup in 2012 when the M16 and its derivatives began to be pulled from service. But one Israeli gun maker that isn’t IWI harnessed the IDF’s familiarity with the M16 and created a whole catalog of AR-pattern carbines with alternating barrel lengths. These are divided between the MZ-4 that keeps the original gas impingement system and the MZ-4P with a gas piston connecting the barrel and the rolling block. Emtan also offers the MZ-47 that employs an AR-pattern small arm chambered for the 7.62x39mm Kalashnikov round. The MZ-series is available in 300 BLK as well (that’s 5.56x35mm) and Emtan are hard at work on a submachinegun. The company’s rifles are sold to both institutional (law enforcement and military) and civilian end users. Whether JAWS sought technical assistance and licensing from a US gun maker is unclear but since the AR-15’s design is lost to the public domain, it isn’t too difficult assembling a similar rifle with superficial changes. The JAR-556 omits the old fashioned carrying handle and has a single length of rail on the upper receiver for mounting optics. Another key feature is an ergonomic pistol grip with individual contours for the user’s fingers. The JAR-556 is available in 11.5 inch and 14.5 inch barrels. A 5.56x45mm marksman rifle called the JMS 556 has a 20 inch barrel. JAWS does offer rebuilds for old M16A1/A2 rifles to make them compatible with the JAR-556. South Korea’s Dasan has a large catalog of AR-pattern rifles and shotguns. 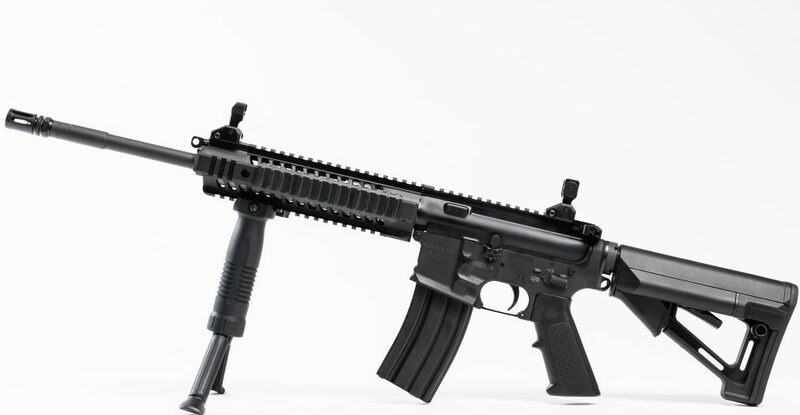 They offer an M16/M4 clone with a gas piston system. Via official brochure of Dasan Machineries. The former US colony and everlasting ally was always an eager recipient of American firearms. In 1983 the troubled ArmaLite that owned the designs of the AR-15 and AR-18 was sold to Elisco Tool Manufacturing Company whose production line began rolling out M16A1’s for domestic use–the Filipino AR-18 never materialized. So prolific was its output that “ArmaLite” became a household name to describe any “long firearm.” But Elisco Tool did go out of business within a decade and AR rifle parts spread among craft gun makers. But aside from the Government Arsenal and its lawful mandate to assemble small arms for the military, one private enterprise has emerged as a credible AR rifle manufacturer. United Defense’s S5 carbine family includes copies of the M4 and shortened “stubby” variants. What sets its AR-pattern firearms apart is a hardened barrel assembly, a modular rail system, and a removable carrying handle. Knowing the limitations of the gas impingement system, United Defense has a patented Pneumatic Valve And Rod (PVAR) built for the M4 and M16 that ruggedizes their use in tropical environments. A handful of other gun making companies in the Philippines offer both AR-pattern rifles and parts. The weapons made in the rump state of the former Yugoslavia were always highly regarded and its small arms still enjoy strong demand everywhere. But a real anomaly is an AR-pattern carbine called the “G15” that isn’t found in any Serbian gun maker’s catalog. To be clear, the renowned Zastava Arms does have a 5.56x45mm assault rifle but its resemblance is closer to the Galil than the M16/M4. But what isn’t commonly known is Serbia’s military industries have had access to NATO production techniques for decades and some of the world’s biggest “defense contractors” outsource munitions and parts to the Balkan country. It’s not hard to imagine an unnamed Serbian firm acting as a subcontractor making AR parts needed for the North American market. This hypothetical arrangement may have led to a “pirated” M16 and M4 carbine unveiled in 2016. Serbia isn’t a NATO member nor is it part of the EU, so finding out if a US gun maker licensed an AR-pattern rifle with a local partner is difficult to ascertain. But no less than the state-owned arms export agency Yugoimport offers the G15 in two variants–the first is an M16A4 and the smaller one is the shortened “commando” with a quad rail handguard. As long as the paperwork is in order, foreign defense ministries can order as many G15’s as they please. The US was exceedingly generous to its Asian allies during the Cold War and a clear sign of its trust was transferring small arms production. Licensed copies of the M16A1 were mass-produced by Daewoo Precision during the 1970s but these were later replaced by the K2 rifle that shared just a few external similarities with its predecessor. Unlike Colt’s bestselling infantry rifle, the K2 used a long-stroke gas piston and eschewed many of the AR-series’ refinements, which contributed to its longevity–the rifle is now in its K2C1 variant. But a little known subcontractor called Dasan Machineries Co. Ltd. has cornered local production of AR-pattern small arms. Its catalog offers derivatives of the M4 carbine and the AR-10 battle rifle, albeit with slight improvements. 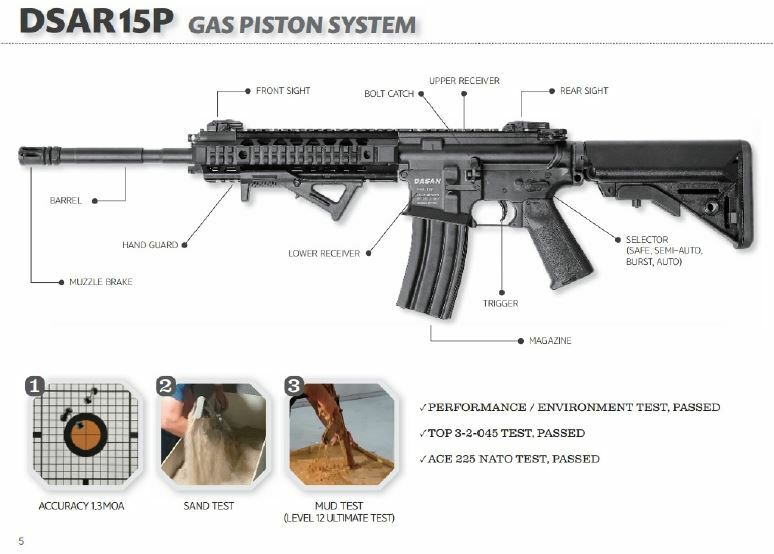 Dasan’s engineers are all too familiar with the M4’s limitations, however, and this explains why gas piston variants such as the DSAR15P were made. For some reason Dasan acts as a distributor for several foreign rifles including the CAR 816 made in the UAE. It sells craftmade Soviet-style AKM’s too. Dasan also shares production of the K1A carbine and K2C1 rifle with S&T Motiv. Turkey’s privately owned gun maker Sarsilmaz offers AR-pattern 5.56mm rifles in standard and special operations variants. Photo via Sarsilmaz. During the 1960s the Republic of China was the only US ally allowed to make copies of the M14 and M16 via state-owned factories. The latter became the Type 65 or T65 that incorporated several changes over the original. This was further developed into the T65K2 whose resemblance to the M16A2 was unmistakable except for the absence of the forward assist button on the upper receiver. To improve reliability, the T65K2 had a sturdy short-stroke gas piston installed above the barrel assembly and concealed by a polymer handguard. It’s ironic how both China, with its CQ rifle, and Taiwan ended up with derivatives of a timeless US infantry weapon. The shortened T65K2C was the closes to an exact copy of the M4 but Taiwan’s army adopted the T86 and then the T91 instead. Both shared a resemblance to the HK416 by having a gas piston above the barrel and sturdy collapsible stocks. 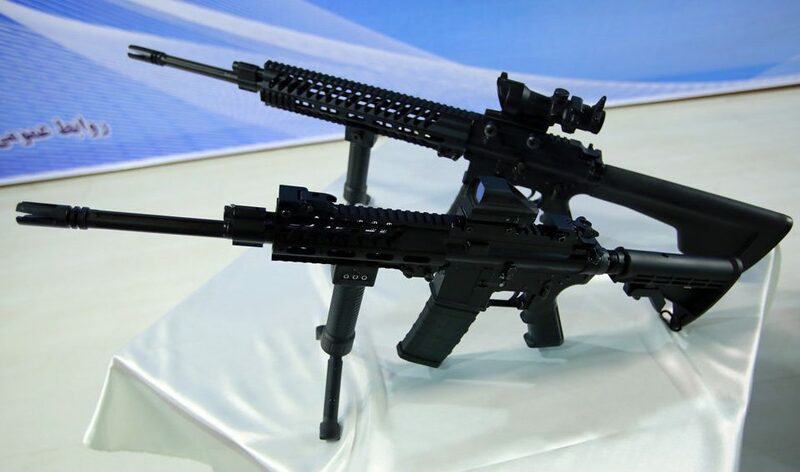 Taiwan does export its military products but discerning buyers can settle for AR-15/M16 parts and accessories from local private companies instead. The troubled NATO ally is unique for the seamless cooperation between private weapons manufacturers and the government. When the industrial enterprise known as Sarsilmaz began making infantry rifles in 2013 its SAR 223C and the SAR 223T that followed were licensed M4 carbines with few discernible improvements. The company then made 9x19mm submachineguns that externally resembled these models. The SAR 223C looks almost the same as the “classic” M4 and doesn’t even have a milled handguard with quad rails for attaching accessories, although this can be added. Its sibling the SAR 223T is tailored for the special operations crowd with its close resemblance to the HK416. But the SAR 223C and 223T retain the direct impingement gas system of their American ancestor. Sarsilmaz does share production with MKEK, a state-owned manufacturer of heavy weapons, for the Turkish army’s new MPT-76 rifles that are available in 7.62x51mm and 5.56x45mm. Both are ready for export. Few US allies in the Gulf have been as dependable and steadfast as the Emirates. In recent years Abu Dhabi’s efforts at establishing a domestic armaments sector have paid off with military rifles compatible with NATO standards. Foremost is the CAR 814 made by Caracal International that was quickly followed by the CAR 816. Both are 5.56x45mm AR-pattern carbines. The CAR 814 is a faithful copy of the M4 and has Picatinny rails over its milled handguard and upper receiver. The CAR816, on the other hand, is a licensed SIG516 with a few cosmetic external changes. Like so many European AR’s it uses a short-stroke gas piston that’s more dependable in hot and dusty environments. In 2015 the CAR 816 was chosen to replace the M16A2’s and M4’s issued to the UAE’s soldiers. But the war in Yemen revealed Emirati troops were still carrying their older weapons. The prospects of Caracal International’s CAR series makes it a competitor to the Middle East’s AR-pattern rifles made in Iran, Israel, Jordan, and Turkey.